Artist John Maybra Kilpatrick, who painted a WPA mural in Chicago in 1947, retired to Ajijic with his wife Lucy in 1964 and resided there until his death on 27 August 1972. While living in Ajijic, Kilpatrick exhibited in the “Fiesta de Arte” group show held in May 1971 at the home of Mr and Mrs E. D. Windham (Calle 16 de Septiembre #33). More than 20 artists took part in that event, including Daphne Aluta; Mario Aluta; Beth Avary; Charles Blodgett; Antonio Cárdenas; Alan Davoll; Alice de Boton; Robert de Boton; Tom Faloon; John Frost; Dorothy Goldner; Burt Hawley; Peter Huf; Eunice (Hunt) Huf; Lona Isoard; Michael Heinichen; Gail Michel; Bert Miller; Robert Neathery; John K. Peterson; Stuart Phillips; Hudson Rose; Mary Rose; Jesús Santana; Walt Shou; Frances Showalter; Sloane; Eleanor Smart; Robert Snodgrass; and Agustín Velarde. John Maybra Kilpatrick was born in Illinois (in either Vandalia Fayette County or Centralia Marione County) on 2 October 1902. He apparently studied at the School of the Chicago Art Institute under portraitist Hubert Ropp, the school’s then dean. Ropp is recorded as visiting friends and former students – the Kilpatricks and Al and Janet Zimmerman – in Ajijic in 1971. John Maybra Kilpatrick became engaged to be married with Lucy Margaret Legge in December 1926. The couple had two children, a daughter born in 1931 and a son born two years later. In 1947, Kilpatrick took part in the WPA murals project. Together with Hungarian artist Miklos Gaspar, Kilpatrick painted a mural entitled “The Children’s Hour” in Oak Terrace School, 240 Prairie Avenue, Highwood, Chicago. The mural is listed as still extant in 2001 when Mary Lackritz Gray’s book A Guide to Chicago’s Murals was published. J. Maybra Kilpatrick. 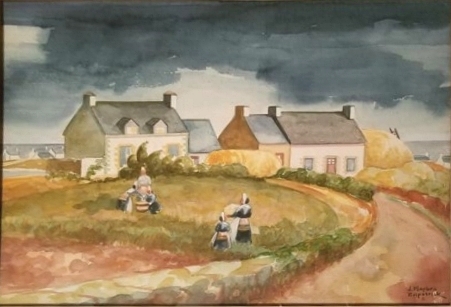 “The Gleaners” (St. Grénolé, Brittany). Image courtesy of Holly Johnson. Kilpatrick worked as a commercial artist for the H. D. Catty Corporation of Huntly, Illinois. In 1952, the corporation applied for copyright for colored Christmas wrapping paper designed by Kilpatrick, entitled “Merry Christmas (Snow scene with 3 figures in front of houses)”. After Kilpatrick’s passing in Ajijic in 1972, Lucy Kilpatrick is regularly mentioned in local newspapers as helping with ceramics classes in the village. No, have not yet found any work by him, though someone somewhere must have some, and I, too, would love to see it! The names in the list are live links. Clicking on one will (a) lead to a post about that artist and (b) change the color of the link so that you know you’ve already clicked on it. I saw your post, and I have what could possibly be a John Maybra Kilpatrick painting. I sent a picture of the painting to the admin, and he posted the photo online, with my permission. The painting was signed J. Maybra Kilpatrick, so it is very likely this is the same artist. I think that this painting is watercolor, from the looks of the color tones. Thanks, Holly, for sending me the photo of your watercolor. I have no doubt it is by John Maybra Kilpatrick. You have a real treasure! Regards, Tony.